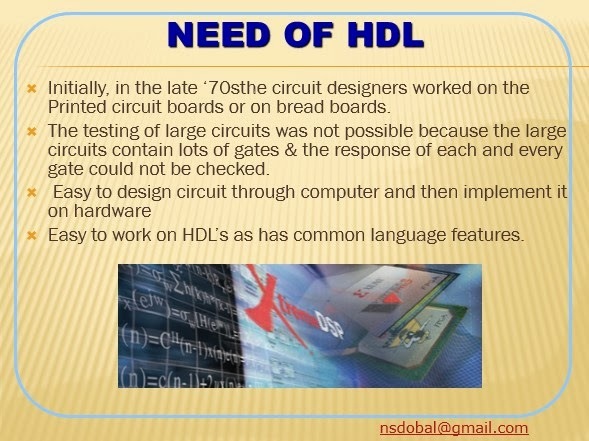 What is the need of HDL Languages : (Learn VHDL with Naresh Singh Dobal series). This is the most Important Question ever, that Why we need of HDL’s, and what we loose without HDL’s? For giving the answer of that question more effectively I am going few decades back, As we discussed previously in early circuit designing (manual designing) or In late of 70’s the circuit designers designed their system with the help of truth tables, Boolean mathematics, K-maps and other expression solving techniques. But chip density and complexity was increasing continuously and then thousands of gates in a single chip was common and for designing that system was not the easy task for engineers. So Researchers planned some new techniques for designing and verification and invented a totally different concept called HDL Based Designing and Verification. And second thing early designer and verification engineers worked on the Printed Circuit Boards or on Bread Boards for test and verify their designs, but that was not the practical approach to verify designs because that takes too much time and also the verification engineers was not sure about the verification. There are multiple reasons behind that like if engineer used 1000 gates in verification that first he have to check the response of all the 1000 gates, because if any one of the gates not works properly then we may get the wrong result. That means each gate must be checked before using in logical verification which was not practically possible. That means testing of large circuits was not possible because the large circuits contain lots of gates and the response of each and every gate could not be checked. Second thing the time needed for logical designing, In early days or in manual designing a large team was needed for designing and more time was needed. After using of HDL’s designing time was shorted because HDL’s are ready to work on sequential execution of statements and the designers only have to write their requirements in the term of language and then synthesis tools convert that High level language into Structural or RTL level or Gate level Design. Hence using HDL’s Circuit Designing was very easy through computer and then we can also develop these codes on hardware using PLD’s. and save time and money.